Here’s hoping everyone had a good Christmas. Investors use several different metrics to judge the value of a company. Probably the most common is the Price to Earnings, or P/E, ratio. This is the stock’s price divided by the earnings per share that the company has generated over the past twelve months. Some investors may argue that book value understates the true value of a company because it ignores these vague assets. A value investor, on the other hand, might counter that the intangible value of a brand can dwindle rapidly in a highly competitive and rapidly changing environment. As an example, remember Palm? Don’t know who or what that is? In the 1990s, there was a lot of blue sky baked into market valuations that dissipated quickly as investors regained their senses. Even long time retail stalwarts like Sears have learned that brand is sand, eroding under the relentless pounding of shifting tastes, technologies and competition. Combining the P/S and P/B ratio – a mashup, so to speak – is the S/B ratio, the Sales to Book ratio, and is sometimes called the Buffet indicator, after Warren Buffet, a well known value investor. While this ratio may not appear in the key valuation ratios for a company, it is derived easily by dividing the P/B ratio by the P/S ratio. Let’s look at two examples in the same industry. Apple has a P/S ratio of 2.59 and a P/B ratio of 5.08. Using simple math we get an S/B ratio of 5.08 / 2.59 which we round off to 2. Microsoft has a P/S ratio fo 4.91 and a P/B ratio of 5.76, giving us an S/B ratio of 5.76 / 4.91, or approximately 1.2. The difference between those two ratios, 2.0 for Apple and 1.2 for Microsoft, tells us that the market values Apple’s blue sky a lot more than it does Microsoft. Fifteen years ago, the situtation was reversed. This was before the introduction of the iPod, the iPhone and iPad. Apple’s brand has become the dominant force in the consumer technology market. Using the book value of all companies we can construct a ratio that tells us the relative richness of asset valuations. We will flip the S/B ratio used with individual companies and substitute GDP, the economic activity of a nation, for sales or revenue. 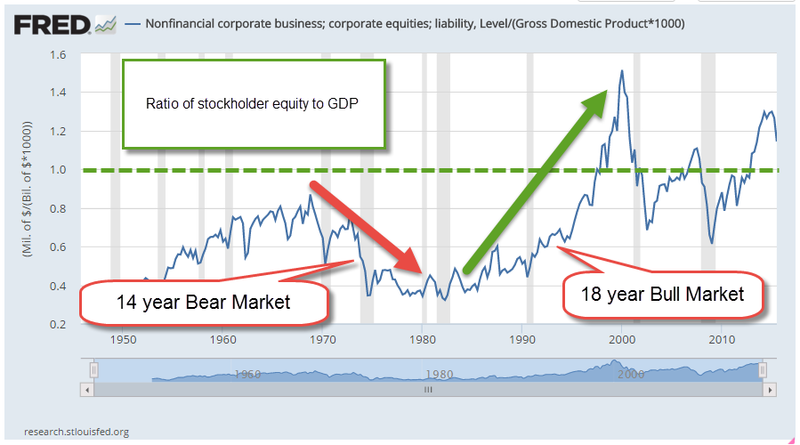 Here is a decades long chart of that indicator. Higher interest rates and inflation in the late 1960s and 1970s helped lower this ratio. By the early part of the 1980s stock valuations, using this method, were so beaten up that they had nowhere to go but up. Lower interest rates and an explosion of technological innovation in the past few decades have contributed to the rise in this indicator. It wasn’t until about 1995 that the ratio was an even 1.0. To the value investor, the ratio and the direction of changes in the ratio are equally important. How much blue sky is baked into current market valuations? Is the ratio rising or falling? Has the market overpriced the future value of the corporate blue sky? If so, future price gains may be muted as investors correct their valuations. 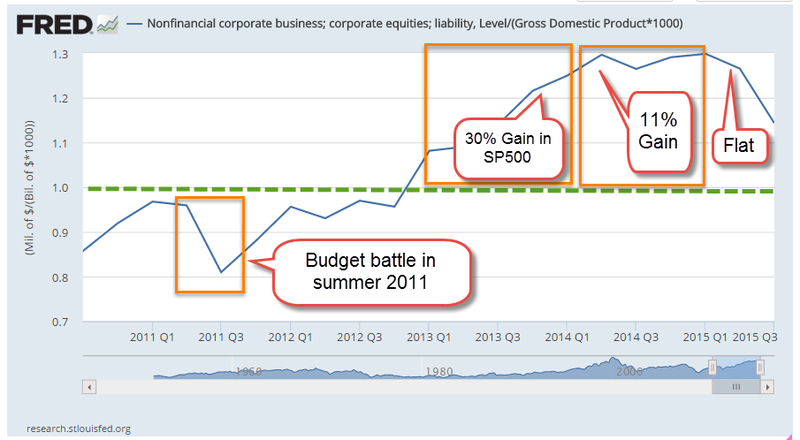 Like 2011, the SP500 index will probably show little gain or loss this year. Here’s a closer look at recent years. The ratio is falling but still above 1.0. Readers who are looking for one more resolution to add to their list can try this one: remembering stuff using spaced repetition with Anki Flashcards. The desktop app is free and there are a number of shared decks of flashcards available for download. In no time, you’ll be able to remember your wedding anniversary. You’ll be able to retrieve French or Spanish phrases stored in some dark corner of your brain along with the lyrics to a 1980s Devo song. Anything is possible. Who was the actress who played Princess Leia? Easy. Who was the director of the movie Touch of Evil? Oooh, repeat that one again.